George started volunteering in the 1980’s as a Rural Representative for the Wheat City Golf Club with the Manitoba Golf Association (MGA). He was then nominated and elected to the Board of the MGA in 1985. During the 20 years on the Board, he served on every committee the MGA had with the exception of the Finance Committee and eventually moved on to be President (2002 – 2004). He was the last President of the MGA and the first President of the newly formed Golf Manitoba. George was also instrumental in the formation and inauguration of the Manitoba Golf Hall of Fame and Museum. Nationally, he served on the Royal Canadian Golf Association Board of Directors as Manitoba’s Class “C” Governor for 10 years. Following a governance change with Golf Canada, he then went on to become a member of the Golf Canada Governors Council, served on the Membership Committee and was Chair of the Canadian Turf Grass Research Foundation until 2015. McLeod also assisted Golf Canada with the amalgamation of the Canadian Ladies Golf Association (CLGA) and the RCGA and served on numerous committees for ten years as a Governor. George has been a rules official, course rater, and volunteer starter/scorer for Golf Manitoba, the RCGA & Golf Canada for over 30 years. Some highlights are: In 2013 he was a rules official for 4 days at the Nott Autocorp Men’s Amateur Championship held at Neepawa. In 2014, he was the Golf Canada Tournament Chair and Starter/Scorer at the CN Future Links Prairie Championship held at the Shilo Country Club. He was a Starter/Scorer at the 2014 Canadian University Championship at Southwood and a Starter/Scorer at the Canadian Men’s Amateur at Southwood that same year. 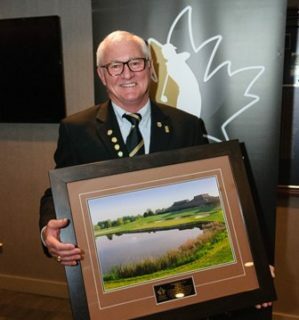 “On behalf of the Board and Staff of Golf Manitoba, I would like to extend congratulations to George McLeod as this year’s recipient of the Distinguished Service Award,” commented Tammy Gibson, President of Golf Manitoba. “George’s leadership, commitment and dedication to the game over the years are certainly worthy of this award and we are appreciative of his many contributions to amateur golf in Manitoba, North West Ontario and Canada” added Gibson. Golf Manitoba is very pleased to honour Mr. George McLeod as the Distinguished Service Award Recipient for 2016.